In the late 1820s, in Waterdown, people formed little informal groups or congregations to worship. There were no churches then. It’s said that Rev. 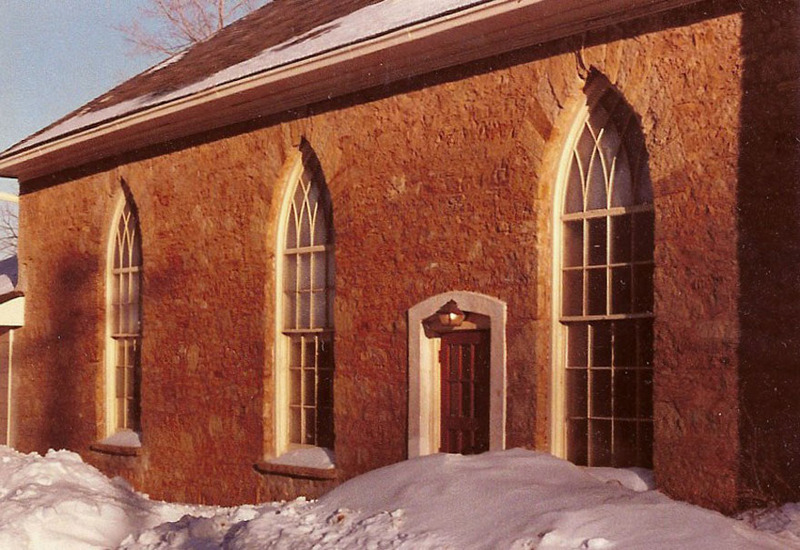 King, the Presbyterian minister at Nelson, and the Methodists, held occasional services in the Glenlee schoolhouse, it being the only place that public meetings could be held. Some sources say that the first services were held in a schoolhouse on Vinegar Hill. The same sources say that soon after, a frame church was erected nearby. This may have been a Methodist building shared by the Presbyterians. We do know that in 1830, Rev. William King, of Nelson, Halton County, established a Presbyterian congregation in Waterdown. It was a Secession Church, that is, a group of Presbyterians who had separated from the Church of Scotland. In 1840, the two congregations of Nelson & Waterdown were received into the Synod of the Church of Scotland. About 1844, there was a disruption or split in the Church of Scotland, with a group of Presbyterians forming what they called the Free Church. This spread to Canada in 1846. Free Church congregations were formed at Waterdown and Wellington Square (Burlington). Waterdown now had 2 groups of Presbyterians, with some of the Church of Scotland people joining with the Free Church. 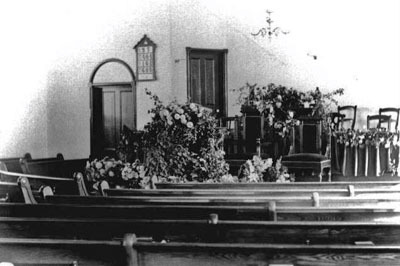 Neither group had their own place of worship, but met in the local schoolhouse, or town hall, or possibly shared a building with one of the Methodist groups. By the 1850s, they both were building their own places of worship. Now, as for the Church of Scotland – a little bit of background ... There was a plot of land on the west side of Main Street - north of Dundas Street - occupied by May’s tavern, in the 1830s - a popular spot, no doubt. It was bought out by Flannigan, who expanded a bit. Flannigan's distillery, was a great institution, but (as the story goes) the better and cheaper Coburg whiskey at 10¢ per gallon soon knocked the bottom out of it. Here, about the year 1853, the property was bought by the congregation of the Church of Scotland, and a new frame church was built, called St. Andrew's. A distillery to a house of worship. It could be said that the village exchanged one ‘spirit’ for another. About 1855, St. Andrew's manse was built. This property is the site of the McGregor Estate today. The Free Church congregation, in 1855, erected a stone church building, called Knox Church. This is the building that we now call the Gathering Hall. It is said that some of the land was donated by Thomas Stock & James McMonies. No records for that property have been found. At least 1/4 acre of land (the Mill Street corner lot) was purchased from Mr. Henry Ferguson Graham, in 1854. The manse was built in 1856, where our parking lot is today. Original Knox church as it looked in the 1800's. The Free Church and the Church of Scotland congregations are our roots. 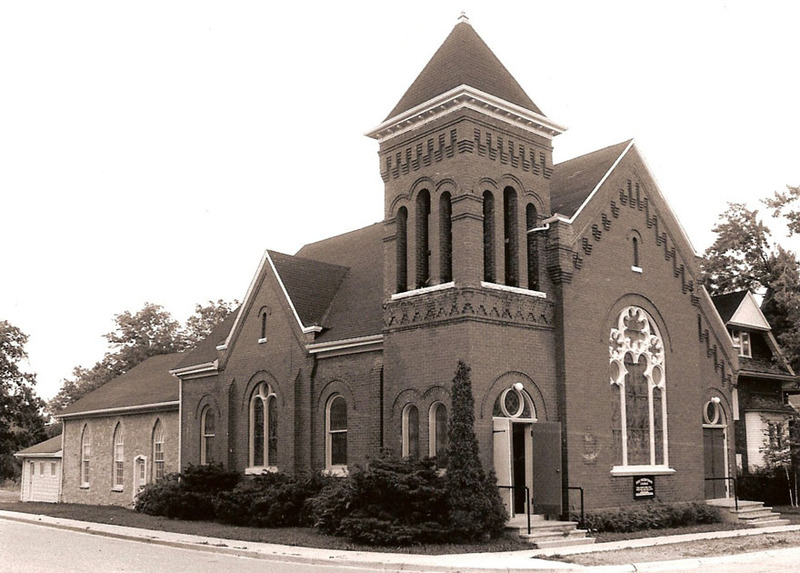 In 1877, they united to form one congregation known since then as Knox Church. 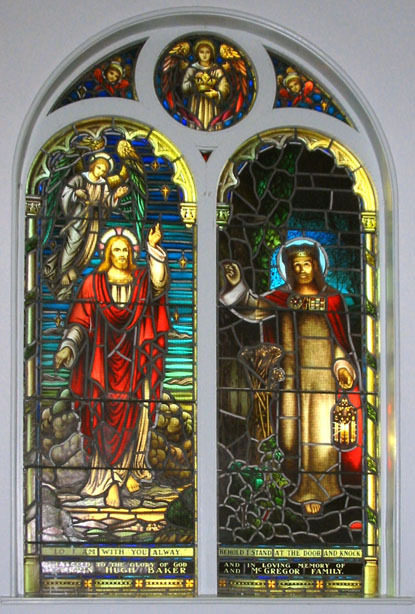 It is interesting to note that the first minister of St. Andrew’s, Church of Scotland, was buried in St. Paul’s cemetery, at Nelson; and the first minister of Knox was buried in the Nairn Church cemetery, at Strabane. 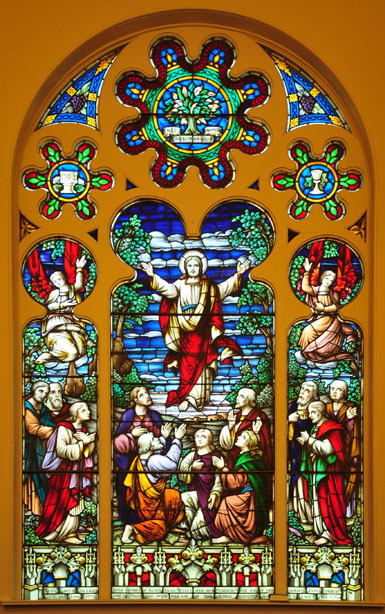 In February of 1900, the trustees of the congregation of Knox Church Waterdown sold to John Owen McGregor of Waterdown, the local doctor, the property containing St. Andrew’s Church (which had been used as Knox Sunday School) and St. Andrew’s Manse. Mr. McGregor had the frame church building moved from Main Street, back on the property, where it existed up to the 1960s as a barn. He added to and modified the old manse. Somewhere within the McGregor House are the remains of the old St. Andrew’s manse! The cornerstone of the new Knox Presbyterian church was laid on the afternoon of June 25, 1901. Knox Church, Waterdown, held its dedication services on Sunday, Nov. 10th,1901 and the new church was formally opened. The new church cost nearly $5000, and supposedly would seat between 400 and 500 persons. Knox church on it's 150th anniversary in 1981, and Knox church sanctuary in 1905 (inset). A major expansion was the building of the kitchen and washrooms in 1959-60. This expansion replaced a smaller, older building at the back of the Church Hall. In the past there were a number of other small additions built and similarly replaced. These new facilities were ready for use about May of 1960. Knox’s latest expansion is the present two stories and basement addition which replaced the kitchen and washroom addition of 1960. At a cost of about $900,000, these facilities gave us much needed room. These new facilities were officially dedicated on January 19, 1997. 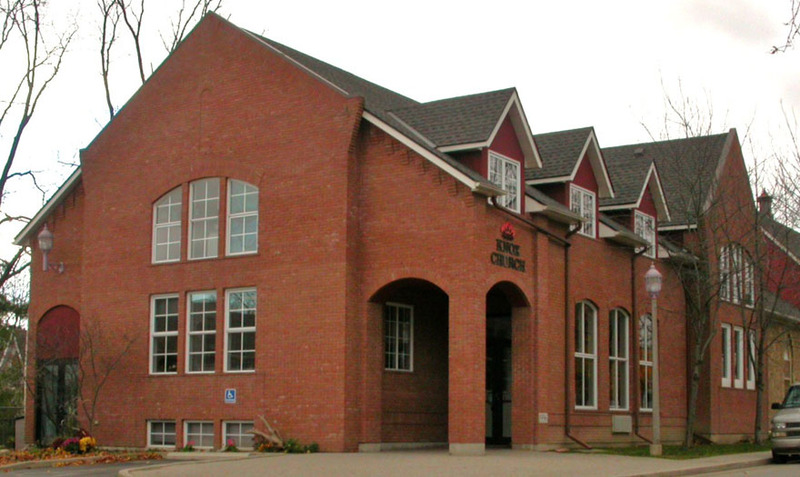 1997 addition including kitchen, offices, library, and new meeting rooms. Church history has always had an importance. It doesn’t change us, but it does help us to understand who we are and where we came from. The most important thing about history is not just the dates, places or buildings, but the people who were involved. Congratulations to those in the past, and to those over the years to the present time who looked (and still look) after this beautiful building where we continue to glorify God. Today we can celebrate with joy and thanks, the foresight of past generations in building, and expanding the building, of our church.